I can’t remember when I would have first helped my parents with their flower and vegetable gardens – but it was at a very young age. I would have learned most things from them, and some bits during my school holidays when I’d help my grandparents on their allotment. 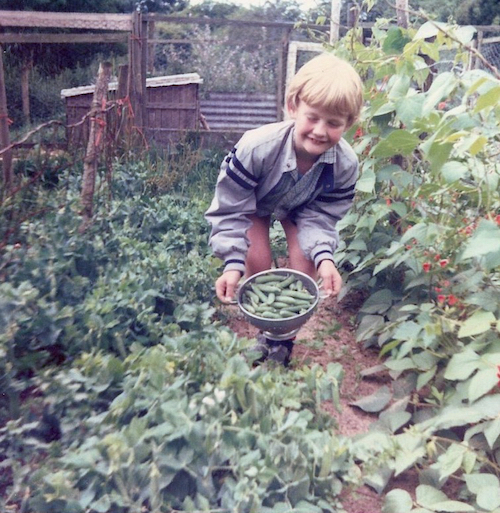 Me picking peas in 1986: Clearly back when photography was so slow you might nod off. That colander was also used as a template for my haircuts. I do remember having a corner of the garden for flowers, including the obligatory sunflower growing competition with my sister. I also remember growing (and picking) rows of peas for a few years in my parents vegetable garden when I was about 6-8yrs. This evolved into building a rockery (it still stands today), planting 140 buddleia in one go, and helping my father to build a pond (which has been home to koi carp, lillies, countless moorhen, toads, frogs, and even a black swan). For many years after this, I lived in several gardenless flats and houses and from the autumn of 2009 until the spring of 2017 I lived in a listed cottage with a tiny narrow outside area. Most of the outdoor space was covered in concrete, apart from a small strip against the wall of my neighbour’s house and but I made the most of growing what I could in a collection of pots. That garden was a challenge – situated on the north side of the house in a drive-way width strip prone to shade. It did catch the sunshine in the morning, and for a short while in the afternoon, so there are a few plants that are happy here. Birds and bees were not common visitors in this garden, but by providing bee-friendly and bug-enticing plants, and improving the soil, I turned this around a bit. My neighbour’s cat Calu, was a frequent visitor, and therefore birds were not. At the end of April 2017, I moved into a 1950’s house, this time with plenty of front and back garden space – which had been dedicated to lawn for at least 7 years. It has been the playground of small children and dogs – with worn out routes in the grass to their much-loved swings, slides, and a huge trampoline. There was a fenced-in patio (why would you do that? ), and a couple of wooden sheds, but when I moved in, other than grass, it was plant-free. I got to start from scratch.